Minibikes are a fun and increasingly popular vehicle to get. Why? Because it’s getting the fun of a motorcycle at a smaller size! But you might be wondering: What exactly are minibikes? How do they work? Where can I get one? Lucky for you, I have a ton of information for you. So, keep on scrolling to find out all the basic information you could ever want on minibikes! 1 What Exactly Is a Minibike? 3 Who Should Buy a Mini Bike? / Who Should I Buy a Mini Bike for? 4 What Engine Sizes Are On Mini Bikes? / How Fast Can They Go? 5 What Type of Gas Is the Best for My Motor? 6 How Much Gas Can the Gas Tank of a Minibike Hold? 7 How Long Can I Ride a Minibike Nonstop? What Exactly Is a Minibike? Minibikes are smaller than your averagely-sized motorcycle. Because of their size, it is much easier to maintain them and move them around. They’re also much more affordable than a full-sized motorcycle and is a bit easier to master riding and can be a better experience for a first-time rider. 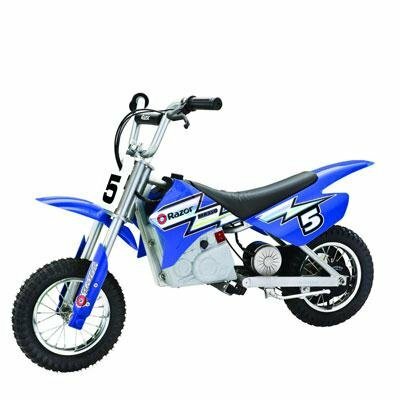 Pit bikes are popular among younger riders because of how they are made and their affordability and maintenance required. They have a shorter wheel base that makes them more stable. These also tend to have much less accidents and injuries when compared to full-sized motorcycles due to how rider friendly they are to ride. Some people take their pit bikes over to the concrete skate parks – not ones made of wood because the torque could tear up the wood – but there are some dedicated exclusively to pit bikes. You can also practice stunts and road riding for more difficult challenges and to have far more natural obstacles to navigate around. Check your local area’s laws and see where it is legal to ride your bike – a lot of areas won’t let you ride on the streets or pavement. These minibikes are very tiny versions of motorcycles – they’re only a fourth of a standard motorbike! These come with two-stroke engines that can go between 25 and 35 mph and four-stroke engines that can go between 60 and 80 mph. Imagine an incredibly small motorcycle going so fast on a race track! Once the creation of pocket bikes caught on, of course, pocket bike racing began. It draws in both adults and children – because who doesn’t love seeing something go super-fast or even riding something fast? These races tend to take place on kart racing tracks rather than the Grand Prix tracks – most likely due to their size. This is a great event or type of bike to get if you have a child who really enjoys bike races or racing bikes around. As always, if they are a rider, ride with your child and wear all the protective gear necessary. Mini choppers are – as the name says – mini editions of regular choppers, which are custom built bikes. They are made in a wide range of shapes and with a variety of materials because they are custom built bikes. There are a few common looks and materials used, however. For example, many mini choppers tend to use a Briggs & Stratton or Tecumseh industrial engine in them. Others likely have a power sport engine or a dirt bike or ATV engines in them. With the industrial engines, there must be a transmission to get electricity into the back wheel. It’s also very common for mini choppers to use a moped or bicycle rims and tires for the front wheels with larger pneumatic wheels for the back, like golf cart wheels. There are different ways the chopper can be built and arranged down to each individual part, but there is more to cover here. So, in short, mini choppers are perfect for those who still want to have a custom-built bike that doesn’t cost as much money or time to make due to its small size. Quad bikes and all-terrain vehicles are vehicles that can be ridden even though the tires have low pressure and tend to have 4 wheels they run on. They can cover much more types of terrain than many other vehicles can and tend to run slower than other bikes or vehicles. It may or may not street legal in your nation, so make sure you check that before you decide to hit the road with your bike in tow. Quad bikes are different from the others on this list primarily because of the fact that they have 4 wheels. These, however, make them very stable in comparison with the other types of mini bikes because of the additional wheels. If you want to take your child out for a ride or you’re nervous to ride a bike for the first time because you’re worried about falling, this is the best type of bike to ride first. You straddle them like a motorcycle and control them with handlebars, but you’ll feel more comfortable on something closer to a car than something that runs completely differently. The super pocket bikes are the first preference for the riders who want a complete package. These bikes offer a comfier ride with its flexible suspension systems and comfortable cushioned seat. Besides, you have the extra benefit with these super pocket bikes as they come up with kickstands & electric start, which are assembled into the frame. They’re the most realistic mini bikes available in the market. They come up with all the sophisticated features. Most of the super pocket bikes also come up with signal lights, headlights, keyed ignition systems, sequential manual shifting & horn. These wonderful bikes also add measurements in digital & analogue. These super pocket bikes have top speeds, which almost double the smaller ordinary bikes. Their 4-Stroke motors really make the difference. You just can’t go wrong with these super cute pocket bikes. Who Should Buy a Mini Bike? / Who Should I Buy a Mini Bike for? Mini bikes as a whole are fantastic for people who are new at riding, people who want to practice tricks, young children who want to go for a spin, and anyone who wants a slightly smaller and more recreational vehicle than a motorcycle. With mini bike speeds going from 20 mph to 65 mph as a maximum speed, it’ll be easier to feel in control of the bike and you’ll be less likely to be in any major accidents. You should also think about where you can ride it nearby or if it will be for special occasions where you take a trip with it out somewhere else. In a lot of places, you can’t ride a mini bike in the streets no matter what type of tires it may have. If you aren’t allowed to ride a bike in the streets and need to go to a specific location that isn’t near your house, you may want to rethink buying one. So, if you know anyone who lives in an area where they can easily use their bike or are close enough to a location where they can use it, it will be well worth it. It’s also best for people who know or are willing to learn how to maintain it on their own, even the little kids! Although the younger children are likely going to need some guidance to help keep it up and learn how to maintain their bikes, they should know how to care for it if it really is something they enjoy doing. What Engine Sizes Are On Mini Bikes? / How Fast Can They Go? This type of engine is fueled by regular gasoline and can power up quickly – in a single crankshaft revolution and in two piston strokes. These engines are very lightweight because they don’t have very many moving parts within them. These engines are the type you want to make sure your bike has if you don’t want to be speeding around at 60 miles per hour. The average speed you can get while using a two-stroke engine is around 25 or 30 miles per hour. Depending on your bike design and weight, you may be able to go higher. While these engines are great for slower travel and being lightweight, they produce a lot more exhaust than four-stroke engines do. It’s also not great for people who want to race at incredibly fast speeds. The four-stroke engine uses four piston strokes with intake, compression, power, and exhaust then will fire itself up on two-cylinder passes. A major advantage of this engine is that it is more powerful than the two-stroke. However, it is also heavier because it has many more moving parts within it. It still uses standard fuel to run, but it also tends to have more pre-ignition misfires that wastes more fuel. This is a good engine for people who want a more durable engine or an engine that goes a bit faster. Again, depending on how much you weigh and the design of your bike, you can get to about 30 mph. Electric engines are different right off the bat when compared to the other engines because they don’t run on gas. This tends to it much more cost efficient to get a bike with an electric motor because you won’t continuously spend money on gas. Electric engines tend to have motors that run at about 400 watts that are attached to batteries and are embedded into the rear wheel’s hubs. The wires of the battery pack go straight to the motor. With this style of motor, you can easily reach 35 miles per hour. If you want a speedy but cheap to maintain engine, this is probably the best one for you to get. What Type of Gas Is the Best for My Motor? It’s important to note that there are different octane ratings for gas. The octane rating simply means that the fuel will be able to better resist “kicking” during ignition. The higher the rating, the better the fuel is at resisting kicking during ignition. There are different gas ratings that are recommended for each type of vehicle or motor type, so you can also double check with your user manual to be sure you are using the right rating. For many pocket bikes, it is recommended that you use 87 or 91-93 octane rated fuel. For every pocket bike, you should be using a type of octane premium unleaded fuel. But again, you might want to check with your manual or what others say has worked best for their bike as some engines may need a mixture of gas and oil to run. How Much Gas Can the Gas Tank of a Minibike Hold? Again, this all depends on the type of bike you get. However, minibikes of all varieties tend to be able to hold somewhere between 1.5 and 2 gallons’ worth of gasoline. Check your own personal manual or with the dealer to see how much it can hold. How do I stop the gas from leaking out of the overflow tube? The overflow tube is a part that is connected to the carburetor of your engine. It’s really to ensure that any access liquids, like gas or water getting into your tank, will leak out in a way that won’t harm any of the other parts of the engine. But how do you fix it if gas keeps leaking out of this tube? There are a few reasons why it can become stuck and ways you can fix them. Having a stuck float, float needle tip, or having a poorly seated O-ring can cause it to leak, for example. Sometimes the tube can also just get gummed up. One way to approach any of these problems is to carefully take the carb apart, use some carburetor cleaner, and spray everything out to clean it. You could also use compressed air in this situation. It is, however, often due to the float being stuck. If this is the case, you can bounce the bike on the ground a few times to get it unstuck. Raise the rear wheel about 2 feet off the ground and throw it back down. This will usually help shake the stuck float back to where it should be. You’ll know when to stop because the gas will stop leaking out of the tube. Another easy way to make sure it won’t leak continue leaking, and you have thrown your bike down many times, is to check each part and make sure they are secure in the carburetor. If you aren’t sure what to do, look at the owner’s manual. It is included for a reason, so you might as well make use of it! If you really aren’t comfortable fixing it or troubleshooting it, ask a trusted friend who knows what to do or go to a mechanic. How Long Can I Ride a Minibike Nonstop? This depends on how much gas your bike can hold for the most part. You can usually ride on minibikes pretty much nonstop for 2 or 3 hours straight. However, if you need to refill your tank of gas, you should wait at least 10 minutes before riding anywhere again. Also take a few minutes after each spill to check on your bike! You might have not only hurt yourself but messed something up on your bike, depending on how you fell and whatnot. Taking a few minute breaks every now and again to make sure everything appears in order and to get some water is probably the best way to stay safe on your bike. First thing you should know is that the speed governor is in place to make it so you won’t be going as fast as the bike can go. This is great if you are a very new rider or if a young child is riding the bike. You can move the choke level into a position between completely opened and completely closed. You can access it without any tools (it will be placed on the right side). There is another way of changing the throttle travel. You are able to change the throttle cable clack by the tensioner. You just need to take off the rubber dust sleeve and after that you need to release the tension ring. Your engine could be a little different, so look in your owner’s manual or ask someone with a bike like yours how they have adjusted the max speed they can go. So, there has been some basic information given for a minibike throughout this article. To finish off this article, here are the currently top-rated minibikes that you can get with some additional details about them. This bike is being sold on Amazon for just under $250, not a bad price at all for a minibike! It’s a great dirt bike that has large knobby tires with dual suspension to handle any off-road riding you may do. The battery pack can last for 22/h miles before it needs to be fully recharged, so make sure you are aware of how much batter is left in your bike! This equals about 30 minutes of nonstop use. It isn’t a very long period of time for any means, but for the price and size of the bike, as well as how fast it can go, this isn’t too bad to work with. Get an extra battery pack or two so you simply have to change it out before you get to keep riding again! It also offers variable riser handlebars to make riding more comfortable for you. The adjustable handlebars also mean both a child and an adult can share this single bike with no problems. The catch is that the adult can’t weight any more than 140 pounds as that’s the max it can carry. But if you’re a parent that has many kids and teenagers in your care, this might be a good bike to consider getting and having them trade off. Some of the pros given from both reviewers and based off of what is listed in the Amazon products description are that it’s a good price, the Razor MX350 has dual suspension, adjustable handlebars, a torque electric motor, and pretty good battery life. However, some of the cons are that it could be too tiny for pre-teens and older children and that it doesn’t come with any training wheels. If the pros outweigh the cons for you, it comes in blue, the battery takes 12 hours to fully charge. Here’s yet another popular mini bike! 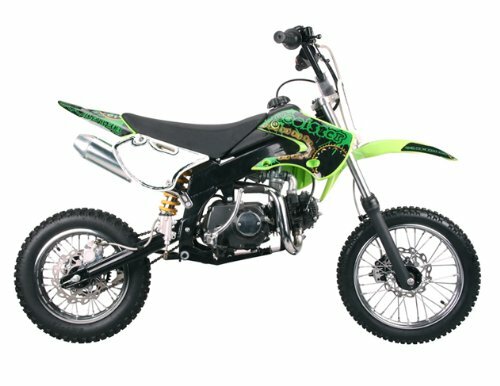 The dirt bike 125cc semi auto clutch is the perfect size for teenagers and adults. It also has 125cc air cooled engine in it so it can go 40-45 mph. The 125cc semi auto clutch frame looks a lot more like an actual dirt bike’s frame, so it has far smoother off-road performance. The pros of the 125cc semi auto clutch are that it has an air cooled engine and some very strong brakes. You might be able to call the fact that the frame is very motocross inspired a pro as well! The cons are that the suspension is a little bit too weak for any off-road performance. This bike comes in green, weighs about 170 pounds! The Coleman CT200U is different from the other two bikes because of its old school design for a minibike. The 4-stroke 196cc gas engine can run at a maximum of 3 horsepower. Thinking about all the cars you’ve anted in your lifetime, this may not sound so exciting. However, while it isn’t super-fast, it does accelerate quickly. It has incredibly strong brakes on it so it can stop you pretty quickly. You can also get it so it’s a 196cc engine that runs at a maximum of 6.5 horsepower if that is important to you in a bike. This option costs about $100 more though. This bike was designed with both adults and kids in mind. The durable clutch and steel frame will ensure you get many years of fun out of this bike – with the proper maintenance, of course! It comes with wow pressure tires so you could technically use it for soft ride. For a bike that costs about $548.97, these are some pretty good features. Some pros of the Coleman CT200U are its great gas engine, the sturdy frame, the great brakes, and comfortable design. The cons of the bike are that it can be a bit big for children to use and that there are sometimes oil leak problems reported with some models. The Monster Moto bike can be bought for about $430 from Amazon if you are interested in it by the end of the description here. It comes with an 80 cc 4-stroke gas engine with an automatic no-shift clutch. This means you just have to grip the throttle to get that rush through the bike started. The MM-B105-BR is also prepared with powerful no-dent polypropylene fenders. It has 14-inch steel rims with off-road pneumatic tires and uses a hand-operated rear disc brake to help you come to quicker stops more easily. 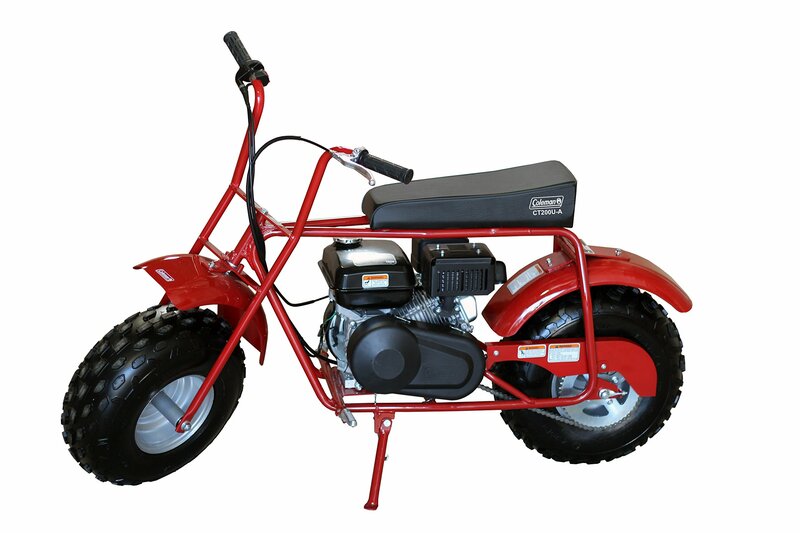 This minibike is truly made for great outdoor usage with its design and quality. Some pros of the Monster Moto are that it is very well-made, it has a very powerful gas motor, and it’s perfect for teens and adults. A major con is that it has a very tiny turning radius. The bike is mainly black with a few red designs on it and weighs around 78 pounds. They suggest that you should be 150 pounds to ride the bike, but they have responded to other buyers on Amazon and said that riders at 190 are above the recommendation, but the real problem is that you won’t be able to go as fast as you may want to. And to end the list off, here is one last mini bike! 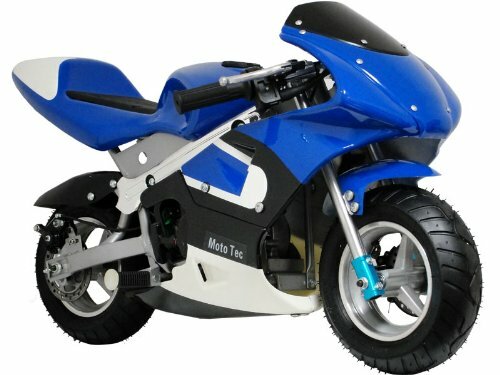 The MotoTec Gas Pocket Bike is one of the most powerful mini bikes available in the market. The MotoTec Gas Pocket Bike has 33cc 2-stroke pull-start engine. This is a wonderful gas powered mini bike, which is ideal for 13 years old or over. MotoTec Gas Pocket Bike has blue, silver and black on the frame, and weighs around 50 pounds. 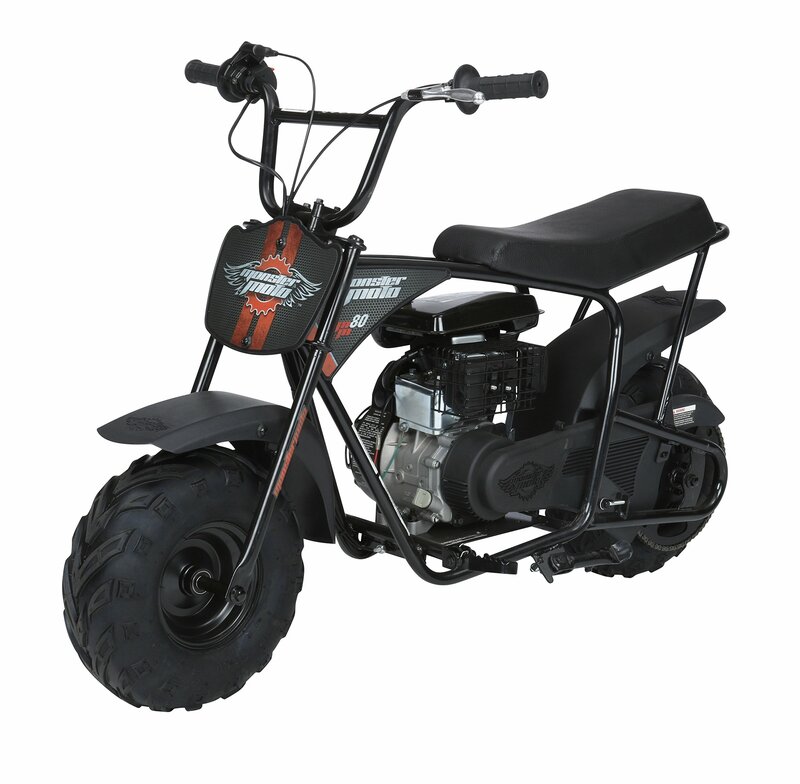 Some pros are that the mini bike has large 11-inch pneumatic street tires, which are very powerful for off-road performance. The front and rear disc brakes are also great. The only con I can think about this mini bike is that the design is not so great. Besides, some users complained regarding the durability issues as well. But overall this is a great choice if you are after really powerful one. As with every other type of vehicle, there are some basic maintenance you should do to make sure it stays in the best shape it can be! It’s not fun and also sometimes time consuming, but it will make your vehicle last longer. There are also some tips about how you should use your bike included within this section to, so look out for those tips as well! This is going first because there are some key facts you should keep in mind when you are considering buying a minibike or going for a ride on your minibike. Don’t use a pocket bike as transportation! They should only be ridden in areas with smooth surfaces that are much more controlled. Look up local laws to see if you can use it on public property or if it can only be used on private property. Don’t ride your bike at night. Avoid riding whenever the road is wet or icy, has speed bumps, or it is made of sand or gravel. These can cause your tires to skid and can cause an accident. Electric run bikes and faster gas run bikes shouldn’t be used by anyone under 12 years old. If you are a parent thinking about getting a bike for your child, you should think about if your child is mature enough and has enough ability to properly use a bike and follow any rules set before they get on a bike. Always wear an ANSI, SNELL, or ATSM approved helmet. On electric bikes, you should also wear kneepads and elbow pads. You may want to get specialized protective equipment for riding your bike if it is a fast bike. Always wear tennis shoes when riding your bike (the kind with rubber soles and shoelaces). Make sure the laces are tied tightly and aren’t hanging off of your shoe to avoid them getting stuck in the wheels. Check your brakes, tighten bolts, and make sure the handlebars are locked into place before you start riding your bike. Don’t let go of your handlebars at any time. Get used to how tight of a turn you can personally make and also make use of those brakes when you need to. Remember, even though these bikes are much smaller than a standard motorcycle and are meant to be used in controlled environments, there is still a risk of injury when you are riding them. So, make sure that you follow these rules to head off most injuries you could get otherwise. There are some things you should do to keep your bike running and in good order to keep riding it. Here is a list of a few of the things you should do fairly frequently to keep up its maintenance. Fuel and oil: Some bikes and engines actually use a fuel and oil mixture rather than the unleaded fuel mentioned earlier. Ask around or check your manual to see if you need it. With this mixture, you don’t need to change the oil in it, thankfully. Instead, you just need to make a mixture of 25 parts fuel and one-part oil before filling up the tank. Spark plugs: The spark plug is around the top of the engine and it’s what ignites the fuel. It needs to be kept clean and look to be golden brown. If it starts gaining a white discoloration to it, this means the bike is running on improperly mixed fuel or that it is running to hot. It should be replaced as soon as it is damaged or when it is too worn out to work anymore. Air filter: As with many engines, air has to go through it to keep it cool. However, with all the dirt and other particles in the air, it has to be filtered before going through the engine to avoid the engine getting messed up. After a while of keeping out the particles and dirt, it will start building up debris on it and letting some of the particles in the air into the bike. Make sure you clean it often as any grease or dirt can have a negative effect on how well your bike runs. It’s located on the front of the motor and usually accessed by removing the protective cover. Chains: Pocket bikes rely on a chain drive to transfer the energy from the engine to the wheels. This means you need to keep your chains in the best shape possible. Lubricate them before you ride to make sure it runs smoothly and make sure it is taut enough to run. You should also check to see if there is any damage along the train as it could end up causing an accident. Tires: The tires of these bikes need to be checked before you go for a ride as well. They are pneumatic tires so they will have a particular level of internal pressure that’s needed for them to work properly. Check your tire to see what pressure is required before adjusting it. Throttle: The throttle connects to the engine through a cable. It’s what starts ignition through motion sent down the cable. This cable should be kept clean and not have any kinks or breaks in it. Check this each time before you start riding as well. Brakes: The brakes are incredibly important when you are in any type of vehicle. They should be tested before each ride, but they are easy to check. Check the cable to make sure it is clean and undamaged as well as the drum, to make sure it is fitting in place fully. Carburetor: This is more difficult to maintain than the other parts of machinery listed so far. It’s what pumps the fuel into the engine and mixes it with the air that comes through the air filter. Because of how complex it is, most of the time you should simply have a professional take a look at it and fix it for you. Of course, there is more you can learn about maintaining and using your bike. This is a much more general overview that cover many of the essentials you will need to know when buying or using a minibike. In the worst case, talk with a dealer, a mechanic, or others who have minibikes and see what the problem is or if you should buy a bike based on how willing you are to keep up this much maintenance. There we go! Now you have a ton of information up your sleeves to be ready to buy a minibike for yourself or a loved one. When buying a bike, there are three main things to keep in mind: Do you have enough time to maintain it on your own? Do you have a place to ride it nearby? And are you looking at buying a type of minibike suited to you or how long you have been riding for? Overall, riding a pocket bike of any variety is a great experience. It’s a rush and you get to speed around in a more controlled environment than you would normally get to on a motorcycle. It’s definitely a fun experience, but make sure you are fully prepared to ride or you won’t enjoy the full experience!